In this tapestry "Capri Vista" we see a beautiful scene from the Italian island of Capris, the work of Robert Pejman. This famous region of Italy in the Tyrrhenian Sea in the Campania region in the Province of Naples has been a resort since the Roman times. The breathtaking beauty of this region has been an inspiration for artists, and has been a resort for many artists, writers and nobility. Here in this tapestry, we see the clear blue seas, the beautiful rocky formations of the islands themselves as well as the garden urns and plants of the villages on the landscape. The plants in the urn as well as the greenery on the rocky formations reflects the fertility and abundant growth on this island. 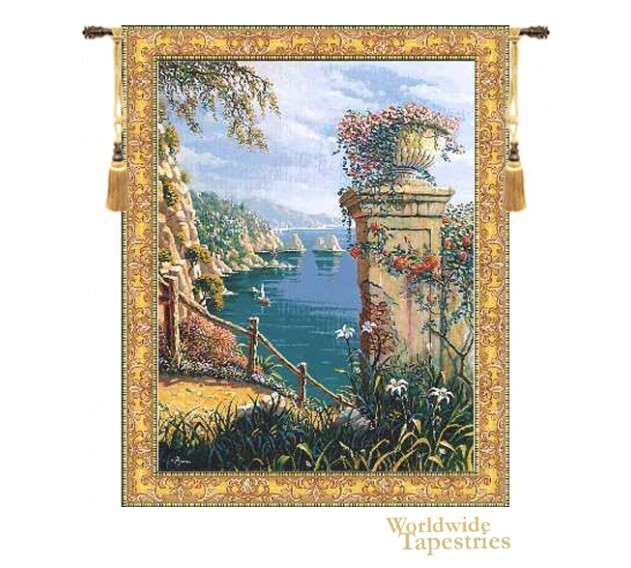 This tapestry "Capri Vista" is backed with a lining and has a tunnel for easy hanging. Note: tapestry rod and tassels, where pictured, are purchased separately. Dimensions: W 38" x H 48"
Dimensions: W 52" x H 64"